Day 5 of our 6 day basement makeover pretty much came out of nowhere. It was already Sunday the 30th and our plan was to have everything ready for New Years Eve. In our “if-everything-could-go-as-planned” plan we thought we’d be done by now but the reality of it was that we were only halfway through with the floors (due to my little snafu with the tight angles around the bar). So we had 1 day to go until the party and the basement still looked like this. — Yikers! While at church, Katie was telling our friends Philip and Rebecca (check out their website here) all about the basement project and how it was beginning to kick my buttocks and without batting an eye they swooped in like the great friends they are and offered to lend an hand! – Score! – I knew we needed help, so I took them up on their offer immediately. We grabbed lunch together and then Philip and I got to work laying the floor. Let’s just say when you’ve got the right tools (like he did) it makes everything much easier. 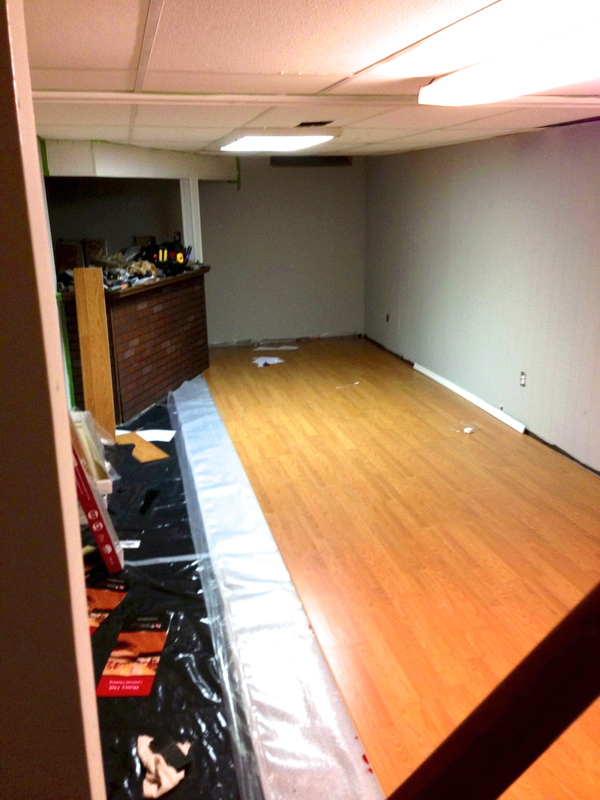 It was still a very time consuming process but we ended up knocking out the majority of the floor by about 10:30p. It looked good (from this angle) but we still had all of the floor behind the bar still to do. 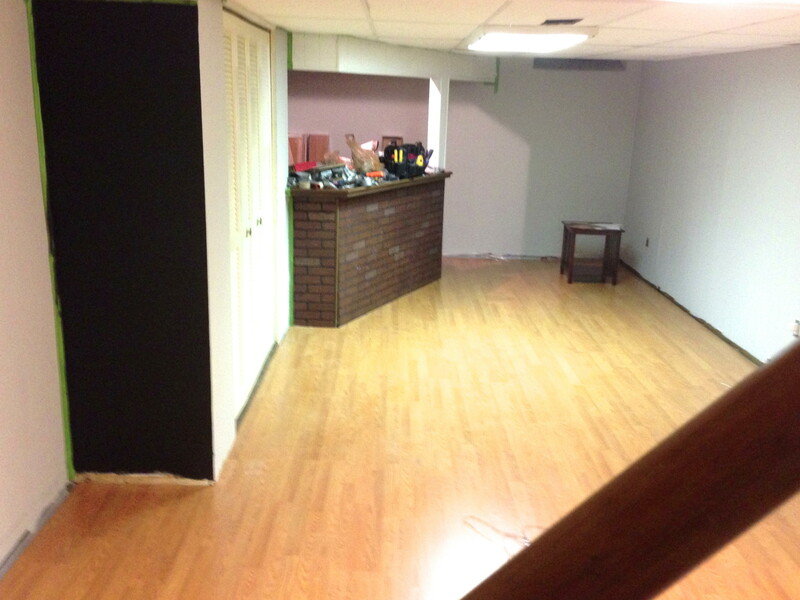 (Excuse the blurry picture below… I wasn’t feeling very photographer-ish spending so many hours in the basement). Philip and Rebecca split around midnight only to turn right back around the next morning showing up at 9a on day 6 – the day of our party. Have we mentioned we have awesome friends? ← Day 4 | Hit The Floor! Friendship is such a blessing! How nice that they came to help! The floor looks great! Thanks Becky 🙂 Friendship is a blessing – we’re missing you guys!